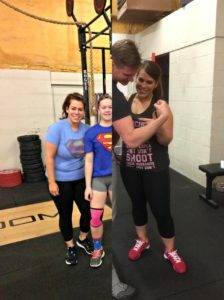 “When I wrote down my goals for the 12-Week Challenge I did not specify weight loss as a goal, however, all of my health and fitness goals rely on weight loss for me to be successful. For me weight loss has not only been about looking good on the outside, but it’s been more about performance in the gym. Yesterday during a visit at Parkview, where I worked full time for 6 years, I had multiple people come up to me and tell me that I look really great and my hard work is paying off. These are people who went from seeing me everyday to only seeing me every 3-4 weeks. Obviously I can tell that I’ve lost weight since the start of the challenge because I’ve gone down a size in jeans (and the size smaller jeans are actually starting to get too big) and I also am having to pull up my Fabletics pants at the gym when completing shuttle runs, box jumps, etc.